MIDNIGHT RIDE - When Rogue Politicians Call for Martial Law. "If we stuck to the Constitution as written, we would have: no federal meddling in our schools; no Federal Reserve; no U.S. membership in the UN; no gun control; and no foreign aid. We would have no welfare for big corporations, or the "poor"; no American troops in 100 foreign countries; no NAFTA, GATT, or "fast-track"; no arrogant federal judges usurping states rights; no attacks on private property; no income tax . We could get rid of most of the cabinet departments, most of the agencies, and most of the budget. The government would be small, frugal, and limited." Spoken by the Honorable Congressman Ron Paul (R, TX), in 1998. This new film will reveal the four types of Martial Law and clarify what the Constitution says about each type. The film is themed on Paul Revere's "midnight ride" of April 18, 1775. By Tyranny Out Of Necessity: The Bastardy Of "Martial Law"
Further, James Jaeger and Edwin Vieira have scripted the movie so that it features most of our "Ten Orders We Will Not Obey"! Getting our "Ten Orders" into a classy documentary film with a cast rich in popular Constitutionalists, including Ron Paul and G. Edward Griffin AND Edwin Vieira, is the sure way to get our Ten Orders on the record for all time. Oath Keepers is delighted. We are helping produce the movie by directly appealing to Oath Keepers' membership nation-wide for donations, the same way we assisted in the production of the Second Amendment film, MOLON LABE. We hope all Oath Keepers will want to see this movie come to life and sweep the nation with the Constitution's message of unalienable personal rights, States rights, and the right -- and Duty -- of our General government to do as the Constitution requires. James Jaeger agrees with Oath Keepers that the Constitution is the written word and will of We The People, in whom all legitimate political power originates and resides. Dr. Vieira has clarified for Oath Keepers what the highest law of the land has to say about the approaching possibility of "rogue politicians" using an arbitrary claim of "emergency" to suspend our Constitution under so-called "martial law", or "martial governance". Such are some of the reasons Oath Keepers wants to help produce this important film. A number of you have already contributed financially to the making of MIDNIGHT RIDE, and we thank you sincerely for your support. You are helping make the movie. All of James Jaeger's Constitution documentaries are produced by public donations. As the money comes in, more interviews are scheduled and completed. I will place a mailing address at the bottom of this email, for those who prefer to mail in a check. There are also ways we can help without sending in money. Tell your friends about the movie, and forward this email to your lists -- helping spread the word pays off as more people become aware of the project that way. Oath Keepers members and supporters are encouraged to go to the film's website and contribute what you can toward the production of this movie. It's a way to give the gift of liberty to our nation at large. And it's some of the best RT&I any of us can do! 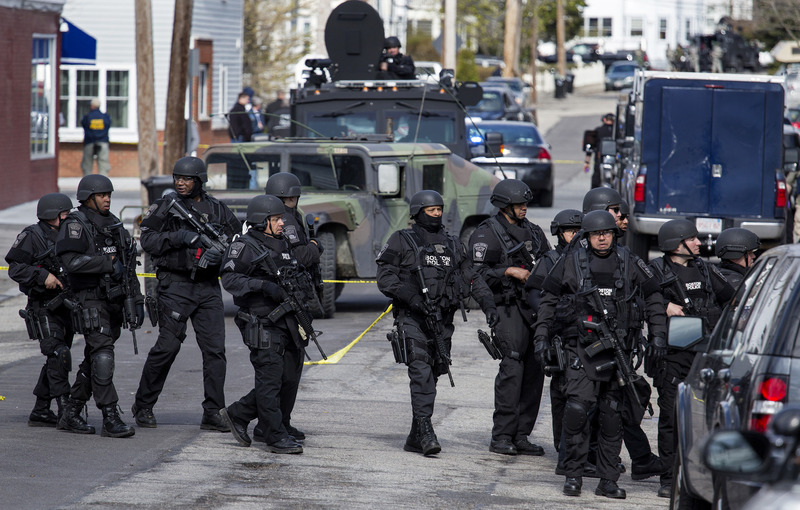 Make your stand against the militarization of our police by supporting this film with your donations and Internet connections. Matrix Entertainment, 223 W. Lancaster Avenue, Devon, PA 19333. I will close by noting that our Missouri Oath Keepers who protected businesses in Ferguson, Missouri and spoke well on camera have generated much good publicity for Oath Keepers. We gained from the good coverage by the New York Times, Fox News, and Ben Swann among many others. That momentum can carry forward as we now document the fullest meaning embodied in our Constitution and our Bill of Rights we pull together to produce this movie. 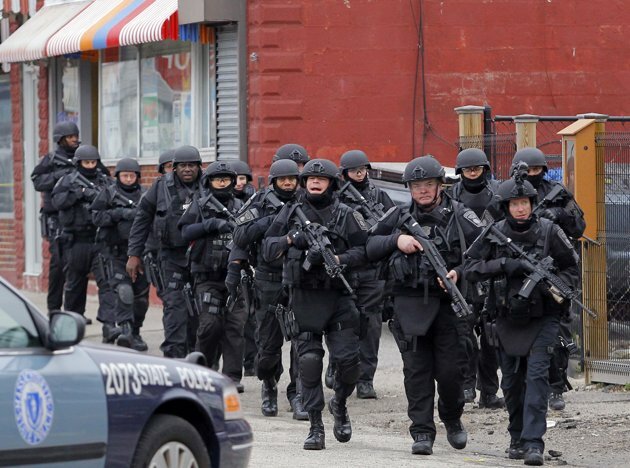 America does not need a militarized police-state under "martial law". As we celebrate Ron Paul's joining of the cast for MIDNIGHT RIDE, Oath Keepers and Matrix Entertainment wish each of you a very Merry Christmas and Happy New Year! We appreciate your support for this movie and for our mission! Please know that your contributions help us spread the word about the Constitution. THANK YOU! Veteran peace officer John Karriman. Missouri police academy tactics instructor, Oath Keeper, and an arsonist’s worst nightmare. FERGUSON • Following a night of arson fires and bashed storefronts that hit close to home, Greg Hildebrand stood naked Tuesday, drying off from a needed shower, when he noticed somebody on the rooftop. But Rhodes, who said he is Mexican-American, was quick to assure that Oath Keepers is not anti-government. He said those pulling rooftop security in Ferguson are current or former government employees and first responders, many who have intense military, police and EMS training. “We thought they were going to do it right this time,” Rhodes said of government response to the grand jury decision released Monday night in the Darren Wilson case. “But when Monday rolled around and they didn’t park the National Guard at these businesses, that’s when we said we have got to do something. The Internet burst open in buzz over the Oath Keepers volunteering to guard local businesses during the protests and riots At Ferguson, Missouri. Standing atop business buildings with convincing arms gave small business owners a sense of security during the heights of the unrest which engulfed Ferguson. Oath Keepers supports the protected right of the people to peacefully assemble, and also to question their government’s policy by voicing redress of grievance. That is part of what Oath Keepers will always protect – the First Amendment rights of the people. 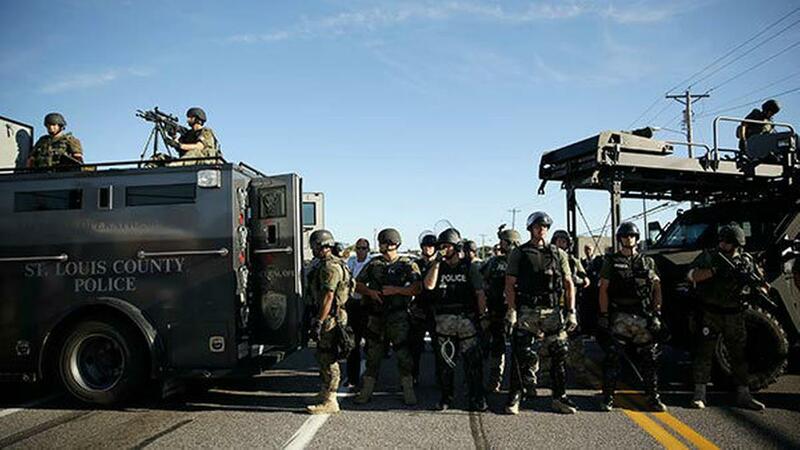 Earlier this year, in April of 2014, Oath Keepers opposed the “free-speech” zones fenced off by the government at the Bundy ranch in Nevada, and Oath Keepers likewise met with protesters in the streets of Ferguson to support the protesters’ rights. But Oath Keepers also protected property from criminal acts which damaged or destroyed other buildings. Besides the peaceful protests by most of the citizenry, there was also a notable degree of destruction by arsonists in which a number of buildings were burned and destroyed, or were ransacked by looters. Oath Keepers does not support that sort of ‘malum in se’ crime. The Constitution does not support that sort of behavior and neither does Oath Keepers. Several days into Oath Keepers’ deployment at Ferguson pressure from on high directed the police chief to demand that the Oath Keepers abandon their positions as guards of the businesses in their care. But the Oath Keepers quickly consulted a St. Louis law firm and learned that as guests of the business owners, and as unpaid invitees of the business owners, the statute law the police chief was told to use as his justification for banning Oath Keepers from guarding those buildings did not apply, so in a grand and glorious act of lawful defiance against unlawful orders from the “authorities”, the Oath Keepers went right back to work guarding those businesses. In the wake of the national publicity Oath Keepers enjoyed came the clear message about Oath Keepers’ CPT program, that being the mission of Oath Keepers’ “Community Preparedness Teams”. Stewart Rhodes flew into Ferguson to personally meet with local citizens. 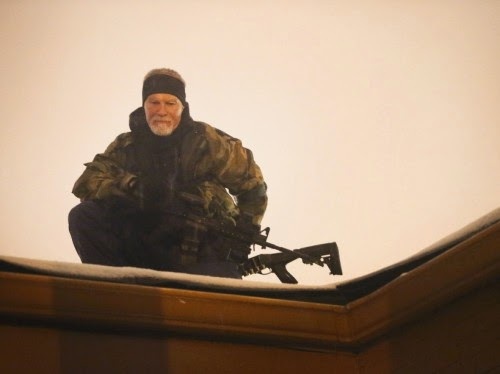 He emphasized the significance of the armed guards on their rooftops and explained why and how the citizens of that community need now to come together and form their own neighborhood watches and study the Oath Keepers model for general preparedness in the event disturbances may again occur. The Oath Keepers message is that the federal government, not even with its newly-militarized police forces using military-styled combat gear and tactics can protect private property. The message is we the people must prepare to protect our homes, businesses, properties, our communities, our States, and indeed, our very nation itself. It is how Oath Keepers intend to live up to their creed as “Guardians of the Republic”. Enjoy a collage of articles written by Stewart Rhodes, with photographs. In short, Cliven, by refusing to sign any grazing agreement, RETAINED his families rights accumulated over decades, while all the other ranchers gave away those accumulated rights in trade for a grazing permit. Mr. Bundy's Range Rights and vested water rights are protected by local law, custom, and decisions of the court as recognized, sanctioned and confirmed by Congress in Revised Statute 2339, commonly known as the Act of 1866. These range rights/ vested water rights are protected by 18 federal statutes starting with the Act of 1866 and ending with the National Forest Management Act NFMA of October 22, 1976. I would like to credit DRAFT RITF REPORT no. 56 Property Rights on Western Ranches: Federal Range land Policy and a Model for Valuation by Dr. McIntosh and Dr. Fowler. The Nevada engineer issued this report regarding the estate of Wayne E. Hage vs the Forest Service, Bureau of Land Management pg 24 and pg 25 "However, he further recognized that existing water rights that pre-date any water rights that may be claimed pursuant to the implied reservation of rights doctrine are superior to any reserved rights of the federal government." Who really runs ISIS in Syria? Incredible speech by Gordon Duff at the Syrian International Conference to Combat Terrorism. Gordon led a group that represented the United States at the conference! Gordon discusses who really runs the United States from the shadows! He names the US Generals and a Senator who runs ISIS! Never in history have the people of Syria been told the truth to this extent! I urge patriots worldwide to share this video and keep sharing all articles from VeteransToday.com Take over the comments for all controlled opposition in alternative media that censor VT! Take over comments and pages for all fake mainstream news! Patriots aroudn the world are now uniting behind our veterans putting out the truth! Never stop sharing VT and bringing more patriots to our team! VT for VICTORY! DEAR JOHN …. Regarding the IRS….. 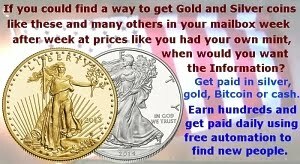 The problem is that neither the “Internal Revenue Service” or “INTERNAL REVENUE SERVICE” which are run under the auspices of the FEDERAL RESERVE, nor the “IRS” which is run under the auspices of the IMF, are government agencies–they are just subcontractors hired as bill collectors by the “IRS” and accountants by the INTERNAL REVENUE SERVICE. It’s hardly worth going after the lackeys. The ones responsible are much higher up the food chain. The one number used as both “your” Social Security Number and “your” Taxpayer Identification Number is used to keep two accounts—one records credit due and one records debts due. The IRS (IMF) keeps track of the debt side, and the INTERNAL REVENUE SERVICE (FEDERAL RESERVE) keeps track of the credit side. However, as irritated as we all are and as unjust and criminally misrepresented their administration of the “income tax” is and has been, we also have to admit that government services have to be paid for. So now we come to the other side of the account ledger. The credit side of “your” account is operated under “your” Social Security Number without dashes and enclosed by asterisks: *123456789* by the “INTERNAL REVENUE SERVICE” run by the FEDERAL RESERVE that has recently reorganized under the auspices of the UN INC. The Secretary of the Treasury has without justification “blocked” most of these credit accounts and pretended that the beneficiaries of these ESTATES are “unknown”—-even though they manage to find you readily enough when they are trying to collect a debt, they pretend that you are “missing” when it comes time to pay one. Most recently the rats have attempted to redefine your ESTATE trust which is operated under your name styled like this: “JOHN QUINCY ADAMS” and run by the Washington, DC. Municipal Government, as a “transmitting utility” owned and operated by the United Nations City State and doing business under your name styled as in: “JOHN Q. ADAMS”. 1917 the Trading With the Enemy Act falsely declared that the American People — the employers of the United States of America, Inc., were “enemies” and conscripted– that is, “borrowed” us and our property “for the war effort”. 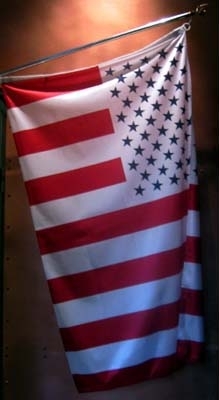 Now, it should be recognized that no corporation has the right to declare “war” on anyone or anything, and that the men doing this had no granted authority to “represent” us in any such manner or fashion, much less authority to lay a false claim against the employers of the United States of America, Inc. It was fraud then and it is fraud now. All claims based upon it are null and void and the rats merely need to be called on it and held feet first to the flames. "We will rally at the capital, openly exchange guns, unveil and plan to break apart the legislation and violate i594 in every possible way. Because ALL law that violates the Constitution is not law, it is VOID!" Check out this exciting announcement as sent to me by Oath Keepers Board of Directors member and North Oregon coordinator Jeff Ford. And be sure to enjoy the video by Gavin Seim at bottom of this article. at the State Capitol building on December 13, 2014 at 11:00 AM to attend and protest the i594 gun control initiative that was voted for in State of Washington. Oath Keepers will have a table set up at the rally but if any of the Washington members in the area can get there at 9:00 am to set up a table please contact Jeff Ford at: jeff4d2003@yahoo.com or by phone at 714-478-1386 (please leave a message if no answer). I will be bringing a banner and an Oath Keepers flag as well as brochures and other materials. We might also possibly be able to have a meet and greet after the rally somewhere in or near Olympia but not sure exactly when or where yet because I don't know the area that well and it's a long drive back to central Oregon. Please look for another email if we come up with a location and time for the meet and greet and/or visit the table at the rally for more information if you can make it there. We will have a local Oath Keepers representative speaking there as well. We're not waiting for politicians, judges or lawyers. Our birthright is NOT to be touched. We call on our Sheriffs, local representatives and legislators to stand with us and uphold their oaths. We will buy and sell guns from whom we please, we will not submit to background checks, we will not give up our rights, WE WILL NOT Comply. We will rally at the capital, openly exchange guns, unveil and plan to break apart the legislation and violate i594 in every possible way. Because ALL law that violates the Constitution is not law, it is VOID! This is being organized by the Gavin Seim for Liberty and Anthony Bosworth For Sheriff and many great volunteers from across the State. Please show up. The video on Youtube had the caption 'Today I become an Outlaw' NO. The gun grabbers who attempt to make non laws to take our guns ARE THE REAL OUTLAWS!